This month we uncover interesting facts and history of the Peridot gemstone which is the birthstone for August. Peridot is one of the few precious gemstones which is only found in one colour; green. 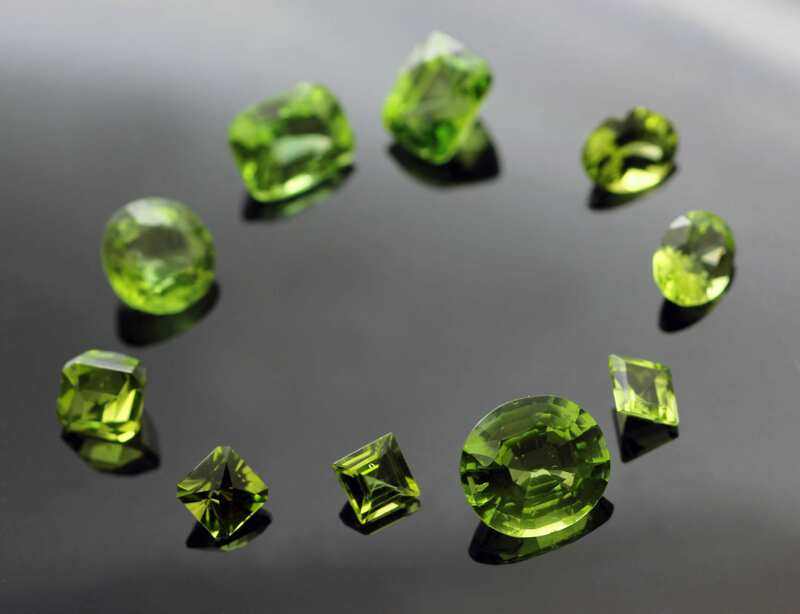 There are variations to the specific tone of green Peridot, which are associated with this gemstone’s grading and ultimately the stone’s value. Shades of green vary from a deep olive tone to a bright and zesty lime green. Peridot gemstones often contain flecks of brown or yellow which appear depending on the levels of Iron found in the gemstone which contributes to the overall tonal variation. 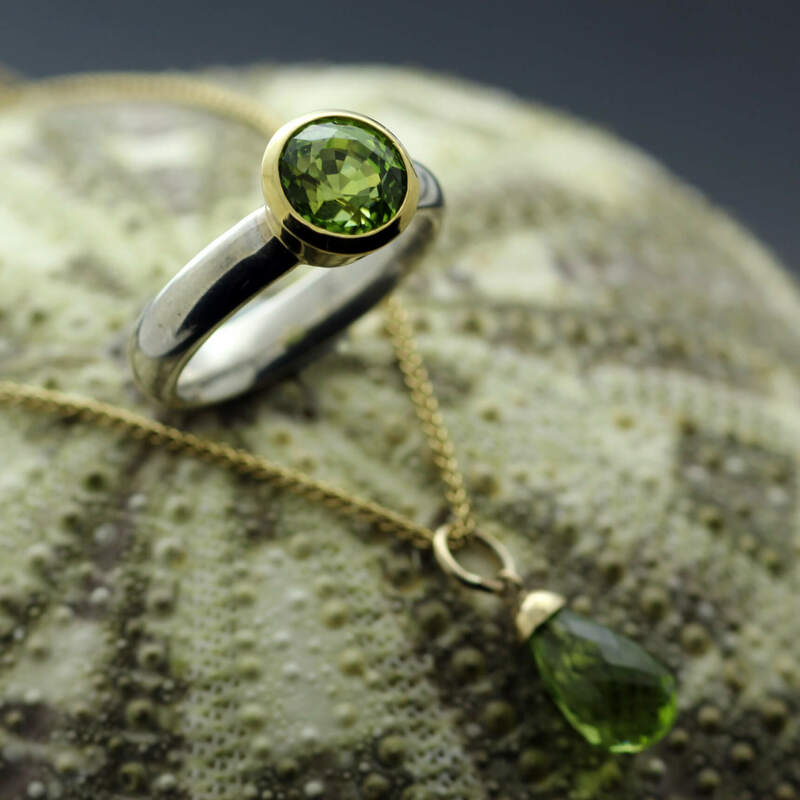 Discover a wealth of fun facts about Peridot gemstone, the Birthstone for August on our new blog. Peridot is a member of the Olivine mineral family and naturally occurring examples of this gemstone can be found in lava beds and even meteorites! Peridots, along with Diamonds are the only gemstones to naturally form deep (over 90 miles beneath the surface) within the Earth’s mantle and are brought close to the surface to be mined by old volcanic pipes. Peridot was once known as Chrysolite, before technology improved and advanced allowing Geminologists to hone their techniques for identifying gemstones. The word “Chrysolite” was also used for some colours of Topaz until advancements were made to improve gemstone classification, making it easier to appreciate and recognise the differences between these gemstones. Peridot has a very long written history. Ancient papyri record the mining of these stones as early as 1500 BC. The main source of Peridot in the ancient world was Topazo Island (now Zabargad or St. John’s Island) in the Egyptian Red Sea. In Ancient times, Peridot stones were used for carved talismans. Peridot was mined for over 3,500 years on St Johns Island. As late as the 19th Century, the Kedhive of Egypt had a monopoly on the mines. At one point, the island’s exact whereabouts became a mystery for several centuries until being rediscovered in 1905. Once upon a time, ecclesiastical treasures in European cathedrals included some fine, large Peridots, but wars and pillage have dispersed many of them. In the Middle Ages, Europeans brought Peridot stones back from the Crusades to decorate church plates and robes. One famous large Peridot gem adorning the shrine of the Three Holy Kings in the cathedral at Cologne was for centuries, believed to be an Emerald, and only identified as Peridot late in the last century. Peridot has long been called “an evening Emerald,” for under artificial light, the stone glows a brilliant green. Peridot is similar to the Emerald but softer in intensity. Peridots of two or three carats are expensive, and a fine eight-carat stone is extremely rare. Any stones beyond eight carats are collectors or museum pieces. Two of the finest Peridot displays containing some of the largest and best specimens are in the American Museum of Natural History in New York City and the Field Museum in Chicago. The Smithsonian Institution in Washington DC has a cut Peridot stone of 310 carats. Peridot gemstone August Birthstone jewellery featuring unique handmade designs by Julian Stephens. Julian Stephens is known for his love of precious gemstones and as a result our Peridot Collection is constantly expanding. Julian’s onsite workshop allows for new Peridot pieces to be created swiftly, particularly when he sources an inspiring Peridot gemstone. Current examples of the Peridot Jewellery available to buy or view through our website would be the Briolette Peridot necklace or this exceptional modern Peridot cocktail ring. Julian Stephens is constantly creating beautiful custom made pieces for our happy clients, a recent addition to our online Bespoke portfolio is an exquisite modern version of the classic Trilogy ring, using a trio of gorgeous Round Brilliant Peridot gemstones set in solid 18ct Yellow Gold. If you feel inspired to create your very own unique piece of statement Jewellery using a beautiful Peridot gemstone please feel free to contact us to arrange a free consultation with Julian Stephens to kick start an exciting creative journey!